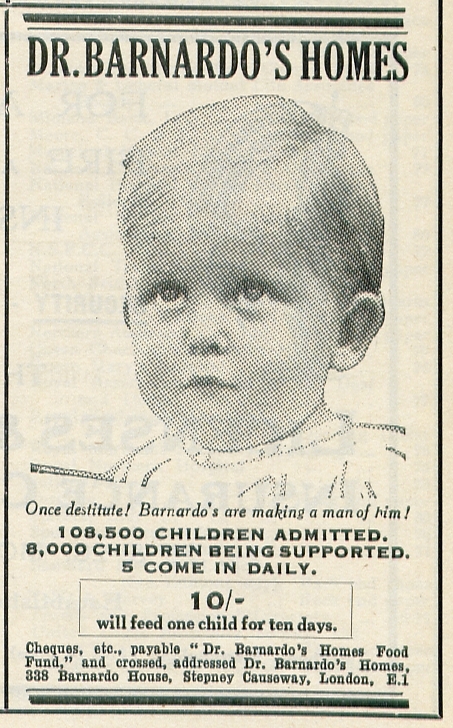 Advertisement for Barnardo’s circa 1931. When institutions fail, individuals step in and get the job done. A prime example is Ivy Sucee, a pensioner living in Peterborough, Ontario. 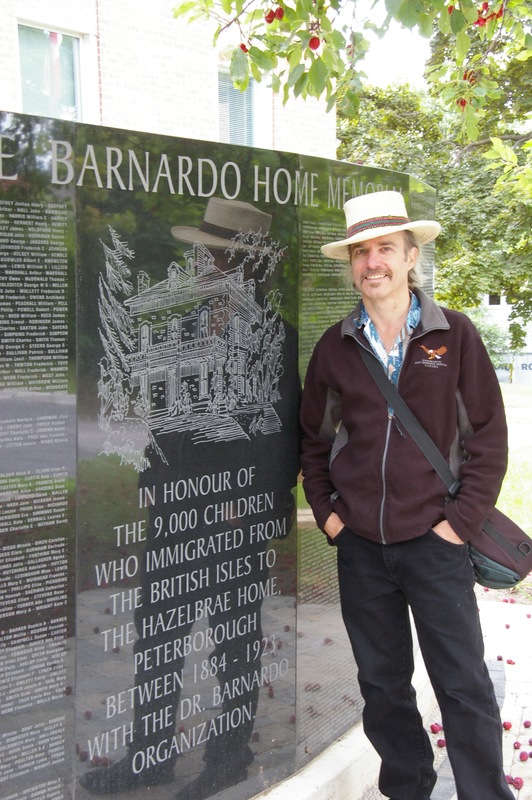 On August 22 Ivy very graciously took Anne Champagne and I on a tour of significant Barnardo’s sites in Peterborough. Dr. Barnardo’s Homes was the British childcare organization that emigrated 30,000 poor children to Canada. 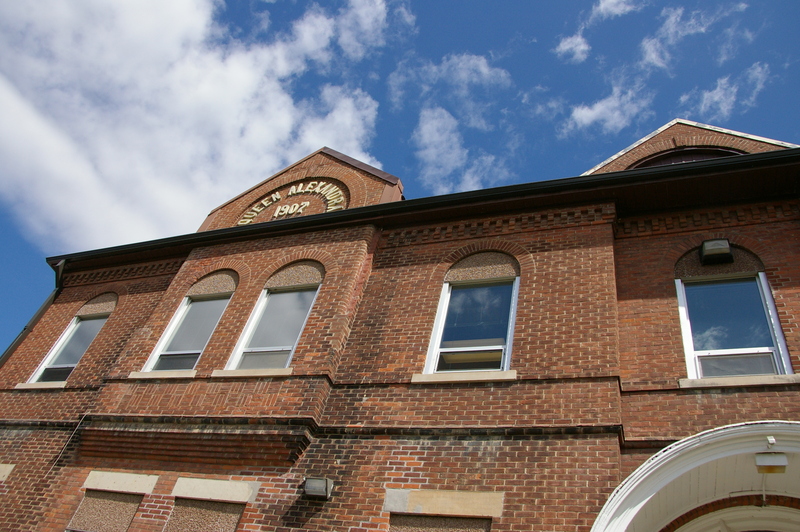 Peterborough was home to Hazelbrae, the largest Barnardo’s distributing centre in Canada for girls. 8,914 girls and boys were brought to this home and then sent to various farms and homes as indentured servants. 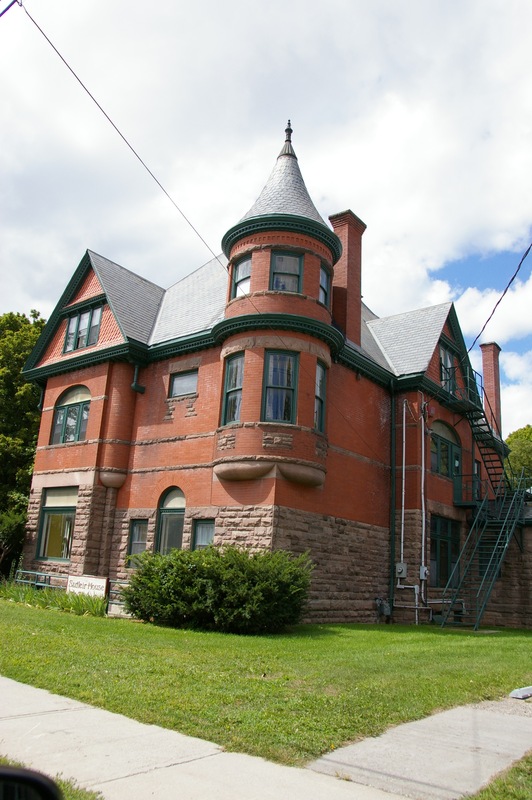 The Home operated from 1884, when it was donated to Dr. Barnardo by Peterborough millionaire George A. Cox, until its closure in 1923. For the first two years of its operation, both boys and girls were distributed through Hazelbrae until it was made exclusively a girls’ ‘home.’ Boys were then distributed through Barnardo’s home in Toronto, run initially by Alfred Owen and from 1919 by John and Rose Hobday. 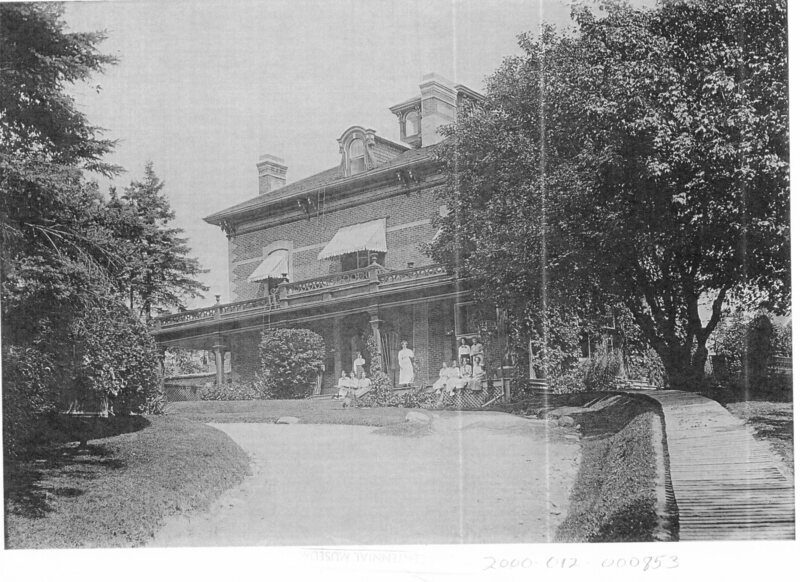 Hazelbrae was known from 1912 as the Margaret Cox Home. However, there is only one small picture exhibit devoted to Hazelbrae in the Peterborough Museum and Archives. This to me seems a major oversight given the major role in history played by this Home not only in Peterborough but for all of Canada. Ivy is a delightful personality—a ‘little old lady’ about five-foot-two with thinning hair who is equal parts compassionate soul and determined spitfire. She can talk non-stop on the subject of Barnardo’s and never exhaust the subject. Ivy’s father Frederick Roberts was placed in the care of the organization as an infant two years old after his young mother had died. His grandmother was going blind and was unable to care for him. 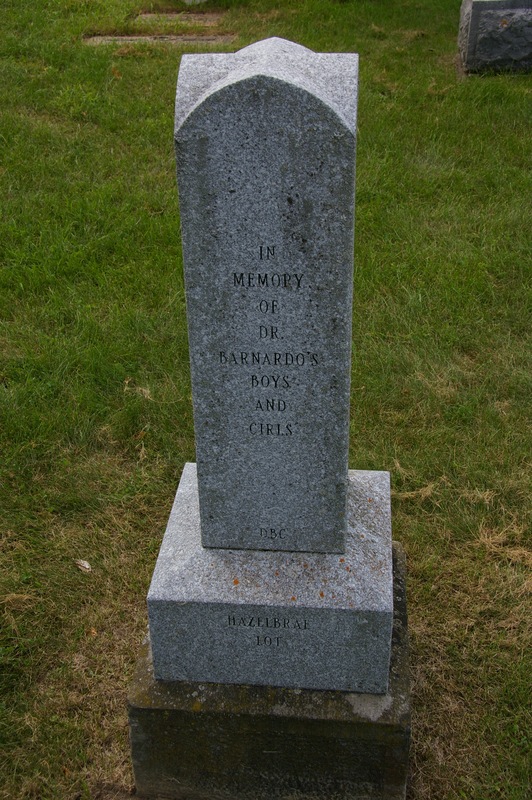 Frederick was emigrated to Canada by Barnardo’s at the tender age of 10, arriving on the SS Dominionin September, 1898. When Anne and I visited Ivy, she told us her father had died never having obtained his papers from Barnardo’s. She took up his cause in 1995 when she began corresponding with Colette Bradford, head of Barnardo’s After-Care. The organization up to that time had a poor record of disclosing vital documents even to the adult ‘home children’ themselves. Bradford was the beginning of a changing of the guard. She credits Bradford and the Freedom of Information Act with finally cracking open the vaults. Ivy helps families from all over Canada obtain their records from its After-care division. Recently Barnardo’s After-Care began charging families about $200 for access to family records, a policy controversial with some. Ivy is more sanguine about it. Ivy estimates that she has now helped, directly or indirectly, 1,000 families to obtain their records from Barnardo’s After-Care. It’s not unusual for her to send out two or three forms a week. Her face lit up with delight when she learned I was from British Columbia—she can now say she has helped Canadian families from coast to coast. 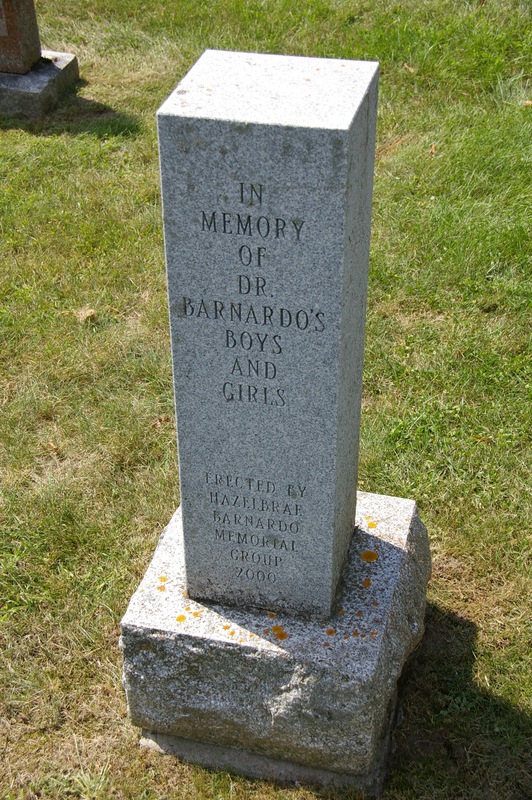 But Barnardo’s remains cautious. Only the most direct relative may apply for the records of a ‘homechild’ ancestor. While for privacy reasons this is understandable, it makes the job of historians rather more difficult. Part of the award recognized her further efforts to have a burial marker raised in the city’s Little Lake Cemetery, where a total of 44 girls and two Hazelbrae teachers had been buried. The first marker, erected in 1999 by Barnardo’s to replace a badly decayed original, commemorated 31 girls and two boys who had been buried there. 3 Hazelbrae teacher Jane Loveday is buried next to the monument. 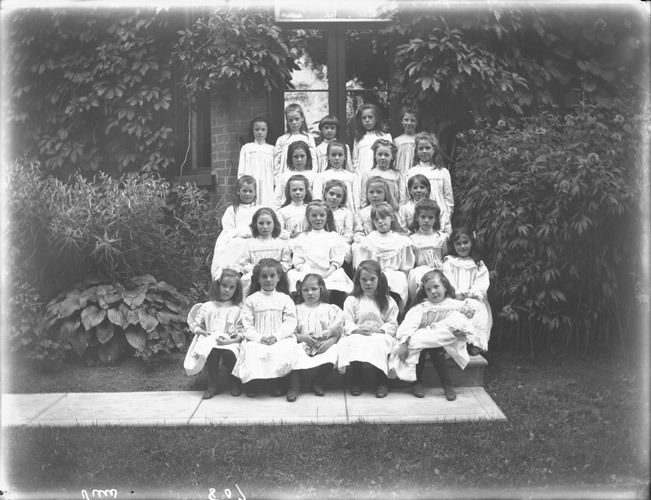 By May of 2000, the Hazelbrae Memorial Group had a second headstone installed, honouring teacher Adelaide Pearse (1867–1918) and 13 girls ranging in age from 11 to 25. Most averaged about 19 years of age when they died. The children died of various diseases or accidents, the youngest laid to rest being 9-year-old Ellen Robinson (1887–1896). Many more died while still in their teens or early 20s. But Ivy wasn’t finished yet. She wanted a way of acknowledging every child who came through Hazelbrae on their way to new lives in Canada. 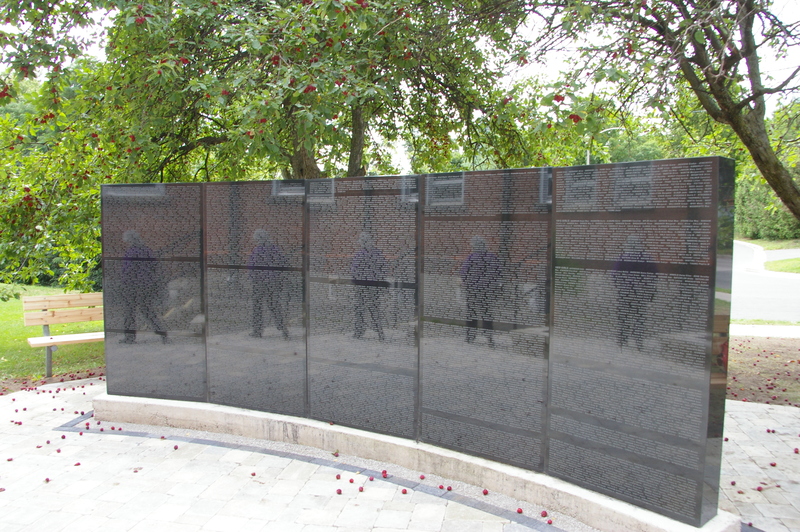 She hit upon the idea of a monument that would list all 8,000-plus names, stamped into polished black granite, designed by Ivy and the Hazelbrae Memorial Group. It took them ten years to raise the approximately $100,000 required to complete the monument, with no government funding of any kind. Ivy raised much of that money through a busy schedule of public speaking engagements and sending out letters of appeal. Meanwhile John Sayers, a researcher with the British Isles Family History Society of Greater Ottawa (BIFHSGO), tracked down the names from the Library and Archives Canada immigration database. (There are four more names to be included at a later date.) After some negotiations with the City of Peterborough, the current site outside the Queen Alexandra School on Barnardo Avenue was chosen. Local artist George Elliott drew the image of the Hazelbrae Home. Gary Foster of Campbell Monuments from Belleville, Ontario built the monument. The unveiling was thus held September 28, 2011 with City of Peterborough councilors Dean Pappas and Jack Doris, Liberal MP Jeff Leal, Alex Dewitt, assistant to Liberal MPP Jim Brownell and George Street United Church Minister Allan Reeve present. Brownell was responsible for private Members Bill 185, proclaiming September 28 Ontario British Home Child Day. Putting names to the brute forces of history helps us personalize it. It helps us realize that these were human beings with complex emotions, caught up in the wheels of something far larger than themselves. Touching that stone, it made me feel compassion for these boys and girls that had once been dubbed ‘nobody’s children.’ It made me hopeful that this physical marker of their vanished presence will aid the process of healing for many families of child immigrants. Ivy’s work on behalf of Canadian families has not gone unrecognized. She is the recipient of the Rotary Club’s Paul Harris Fellowship and is an honourary ‘Barnardo girl,’ as a certificate on her wall from Barnardo’s testifies. On June 5, 2012 Ivy was awarded a Lifetime Achievement Award by the City of Peterborough. The City is to be commended for making up for its neglect of its ‘home children’ history by honouring this feisty, caring woman. The icing on the cake came this year when Ivy was awarded in July 2012 the Queen’s Diamond Jubilee Medal. But for her, all the attention is a bit flustering. Ivy is the real thing—not in it for the awards and accolades, but because she cares. With special thanks to Ivy Sucee, Peterborough Archives archivist Mary Charles and volunteer Sandra Reid for research assistance. 1. Deborah Gardner, Peterborough Examiner, Sunday, April 16, 2000. 2. Deborah Gardner, Peterborough Examiner, Sunday, April 16, 2000. 3. Joseph Kim, Peterborough Examiner, Wednesday, May 17, 2000. 4. 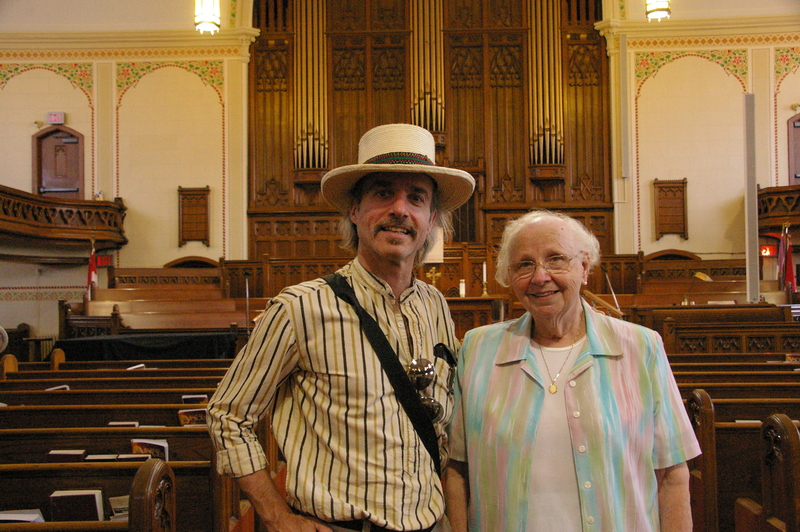 Sean Arthur Joyce, interview with Ivy Sucee, August 22, 2012, Peterborough, Ontario. Aside from the Grace Church which once stood within a block of Hazelbrae, this was probably the main church attended by the Barnardo girls during their stay at the Home. The first church on the site was a timber structure dating to 1836, built by the Wesleyan Methodist Congregation (about where the present Kaye Funeral Home stands). Across the street from the present church a 40’X60’ timber-framed stucco church was built. Remains of its timbers can be seen at the Peterborough Museum. Plans for the current Victorian Gothic structure got underway in the 1870s. Its dedication took place Christmas Day, 1875. It contains magnificent stained glass, a soaring gallery, beautiful woodwork and of course a towering spire. Barnardo children often gave recitals in the Sunday School Hall. 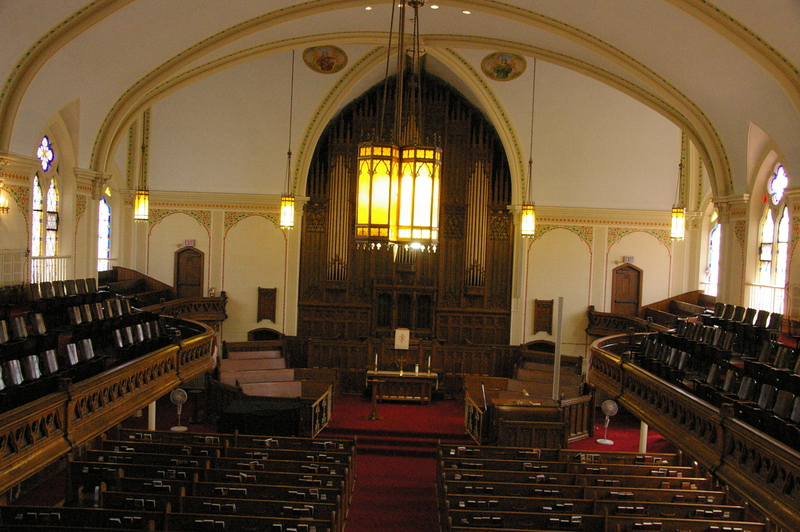 The church was attended by Ivy Sucee’s father Frederick Roberts and she married her husband there. 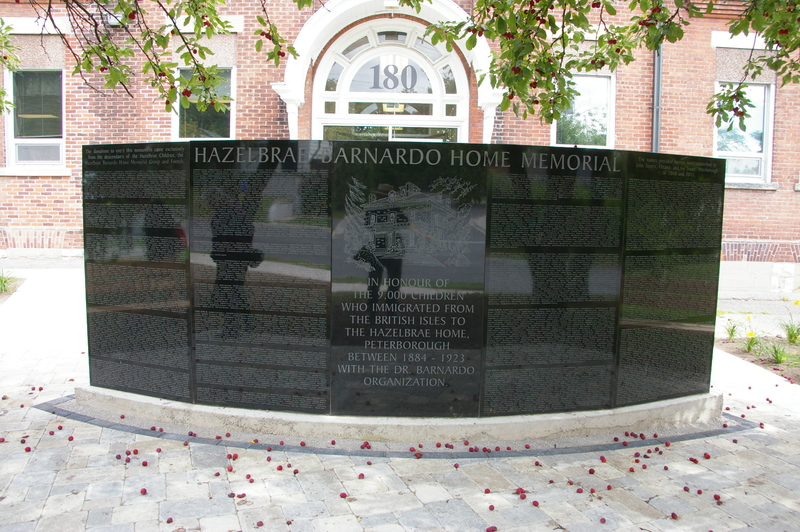 Although a headstone had been raised to commemorate 33 Hazelbrae boys and girls, it had deteriorated badly prior to the installation by Barnardo’s of a replacement in 1999. A second headstone was raised by the Hazelbrae Memorial Group in 2000, commemorating 13 more Barnardo boys and girls and one of their teachers. Ivy says she feels some of them “died of a broken heart,” or never fully recovered from the traumatic ocean journey from England. Given the ages of the boys and girls here, ranging from 9 to their early 20s, it’s not hard to believe. Crescent Street dead-ends in the western end of Little Lake Cemetery so just follow it along the shoreline and you’ll soon see the Art Gallery of Peterborough on your right hand side. The grounds by Little Lake are a frequent site of open-air concerts—a lovely setting. 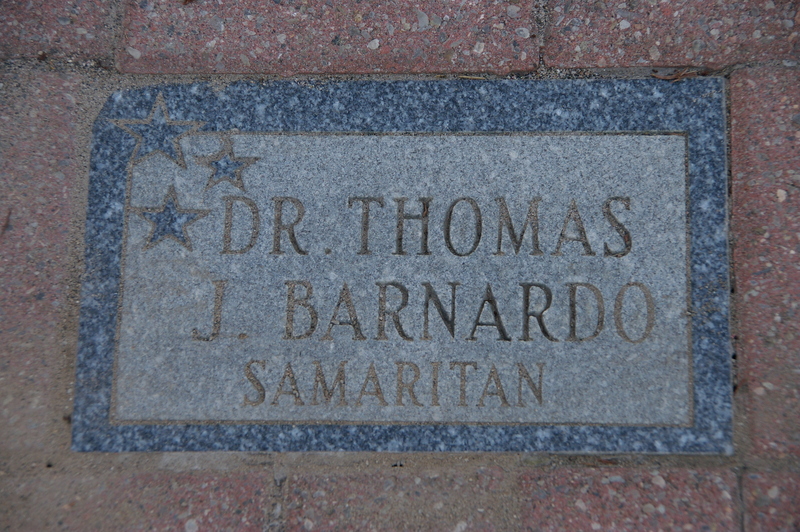 The Peterborough Walk of Fame had been the victim of a glaring omission, according to Ivy Sucee: there was no plaque for Dr. Barnardo. True to form, Ivy lobbied the City and had him included on the Walk. He is described there simply as ‘Samaritan.’ His organization was responsible for bringing 30,000 British children to Canada. Walking just a short distance north on George Street from the magnificent Victorian edifice Sadleir House you’ll see (on the same side of the street) the heritage marker erected for Barnardo’s Hazelbrae Home, thanks largely again to the efforts of Ivy Sucee and her Hazelbrae Memorial Group. 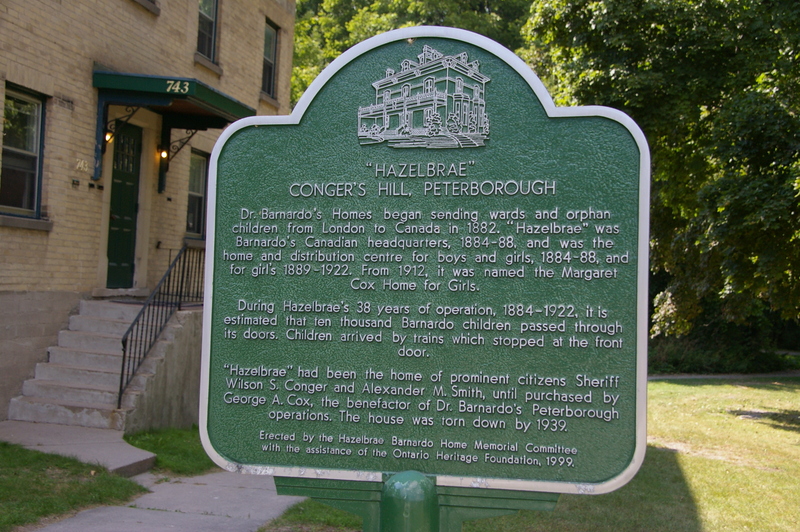 The sign is approved by Ontario Heritage and is located at the foot of Conger’s Hill where Hazelbrae was located, near a railway station (long since demolished). According to Trent Valley historian Elwood Jones, “Their train stopped as it crossed the laneway from George Street to the front of Hazelbrae on the hill overlooking the Midland railway line that is now part of the Rotary trail. The children …had only a short walk to their new Canadian home.” Given the lushness of the Trent Valley surroundings and the relative lack of development in the late 19th and early 20th centuries, one can imagine how idyllic the setting must have looked to these children as they disembarked. To arrange tours with Ivy Sucee or for Barnardo’s research assistance, contact her at 705-742-7523. Her work is supported by donations so please be generous. This entry was posted in History and tagged child immigrants, civilization, empathy, Hazelbrae Home Peterborough, history, home children, social commentary. Bookmark the permalink. Gail, if you contact Ivy Sucee she will happily tell you if your ancestors’ names are on the Peterborough memorial, she should have the complete list. She’s also willing to give you the grand tour, an experience made memorable as much by being with Ivy as by seeing these important sites in the Home Children history. Wonderful research. My grand mother arrived at Hazelbrae in 1904. I look forward to seeing her name on the memorial this summer. My reached revealed that both of my grandmothers were at the After Care home in Barkingside G.B. at the same time. One came through Hazelbrae and the other through Toronto. Amazing. My grandmother Margaret Jane Kerr 11, and here sister Mary Annie Kerr 9, arrived in Hazelbrae in 1901. They were separated and lived in different houses. I wonder if their names are honored on the monument. We have not been able to find Mary Annie’s (married James Cunningham) family. My grandfather, William Preston Davis, was also a home child. Thank you for writing this excellent post. Janice: I would contact Ivy Sucee and she should be able to get you a list of everyone on the memorial. Good luck! My Boyfriend’s Grandmother came through Barnardo house in 1921. She is 100 years of age and lives in Toronto. Lori: you should make sure her story is recorded if it hasn’t been already. And you might want to contact Lori Oschefsky of the British Home Children Advocacy and Research Association. My Dad and his brother came over in 1910 on the S.S. TUNISIAN…ARE their names on the stone…I heard growing up that they had a rough life on the CROWE farm in Douro Ontario…their names…..Dad =ERNEST EDGAR WOOD and his brother HUBERT WOOD Any info would be appreciated. Thank You Ken. Wonderful article. Thank you Sean and Ivy. We visited the site and it is worth seeing. 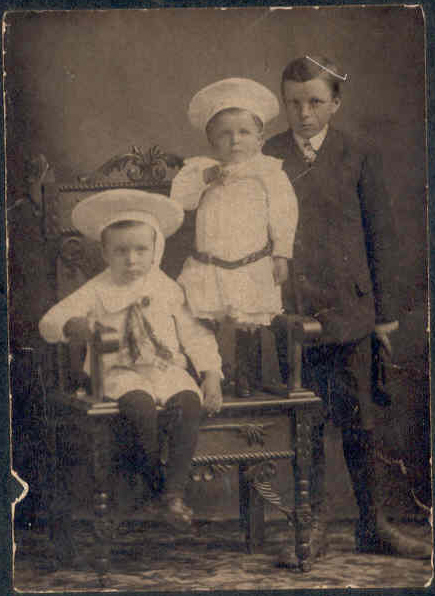 Looking for Reginald Arthur Woodward who came to Canada as a Barnardo child in 1915. Lived in Lindsay Ontario area and worked on a farm. Currently, waiting for more information from the Barnardo Society in which I had to send money to obtain details of my dads adoption. i am trying to find out if my father was a barnardo child. how do i do this. Gail Prentice: I would contact Barnardo’s directly. They are making their records available (for a fee). The other place to go is the National Archives in Ottawa, where you can find online a list of immigration documents for British Home Children. Usually the sponsor organization is listed, though not always. Two good places to start anyway. How do we see a list of names on here. My grandmother And her sisters were sent here. If you’re looking for information on your British Home Child ancestor and you know they were sent to Canada, you can contact Barnardo’s UK After Care Services (Google it). For a £100 fee they will search their records and send you whatever they have on your ancestor. You can also contact Ivy Sucee at the phone number listed in my blog article. She lives in Peterborough and will also have a list of the names on the monument there. Thank you for the insight into where my two great aunts ended up. I know one Florence went onto be married but the other Elsie of whom we have no knowledge.